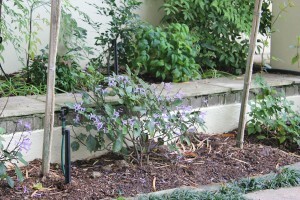 Home > Blog > Gardening > Perenniels > What to do when you don’t like something anymore? What to do when you don’t like something anymore? I am wondering what the general consensus amongst gardeners is about this topic. As I consider plants to be living things, simply pulling them out and turfing them on the trash heap seems wrong to me. But I’ve noticed that landscapers do this without any hesitation, so I am wondering whether its considered PC to do this? I have a few “areas” and plants in my garden that I’ve lived with for some time now and I just don’t like them. What to do? I feel almost as if I was given a puppy for Christmas that gets on my nerves and now I want to ship him off to the nearest shelter … Please tell me its not the same thing? 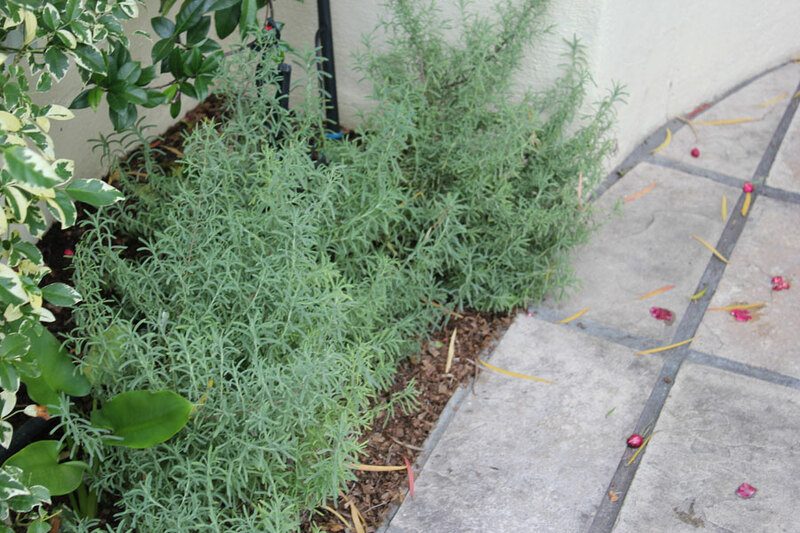 What is the correct way of dealing with unwanted plants that are thriving in one’s garden? 1). 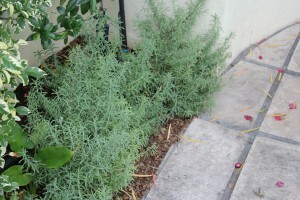 Lavender dentata that was planted in a row in the flower bed beside our pool. Each plant seems to do its own thing, grows in a different way and direction, the result is a border of lavender plants that I don’t think look at all attractive. Its a bit of a higgeldy piggledy mess.There are ten of these I’m thinking of pulling out. 2). Plectranthus “Mona Lavender” has soft stems that just break off all the time – just walking past it seems to damage them. They look very bare and uninteresting now that the season is changing and even when they are bloomimg and full in summer … well, lets just say I am not a fan. I don’t mind having a few of them mixed in with the other plants in the back, shade garden (I have a lot there too), but I don’t like them at all in the front garden where there are eight of them in two rows, all in varying sizes, shapes and in varying stages of growth (or decline). I think I could make this look much better with something else. If any locals happen to read this blog and would like to have these plants, provided you come and fetch them from me you are welcome to have these plants. I’d feel much better if they went to a “loving home” rather than ending up at “the shelter”, aka the compost heap. I am with you on this topic. I have a very hard time throwing a plant on the compost pile. I try to find another spot for it or give it to someone else. Sometimes I may damage it when I dig it up, and so………..but I try very hard to find it another home. I don’t know if there is a right or wrong way to approach this problem…guess it is up to the individual. Anything that grows where it shouldn’t or doesn’t behave in the place its planted is a weed. You’ve gotten lots of advice here to recycle when you can, either in a different spot in the garden or as “gifts” to friends. But, really, yank out what you don’t like. I agree! I think I’ve found homes homes for the lavender and I realized I have a verge outside the property that is shaded and bare, so the Mona lavender can actually go out there. Hi Christine, I cant say I haven’t thought of this before. However the longer that you have been gardening the more acceptable will be the feeling that they served their purpose and looked good at one time, now its time for the scrap heap. Blimey I could be talking of myself. I ask my neighbors and friends if they want them. They can also be donated to a school with a gardening program or perhaps a local gardening group may want them or can advertise in their circle if anyone wants them. If I can’t get rid of them I have been known just to replant them in the back of my garden where I don’t see them just because I can’t imagine throwing them away even if I don’t like them. Fortunately I have space to do this. Great ideas among the above comments! I never feel guilty about moving plants, giving them away, or composting them. I also like the idea of trying some in pots or window boxes, perhaps mixed in with some colorful annuals. I’d also ask around & see if anybody wants them. We have a little free local newspaper that often has ads similar to this. Free plants to a good home! LOL! If I can’t find anyone who wants a plant, I don’t feel bad composting it, either. It’s still being put to good use. Usually one person’s trash is another’s treasure, and I have had made more room in my own garden while simultaneously making a couple of other gardeners very happy by posting my two holly bushes and several day lilies. I felt good knowing they were going to be appreciated somewhere, and I was happy to free up space for a tree peony, which I’ve always wanted. Of course, contributing to the compost pile is also a noble cause if there aren’t any takers! I don’t blame you one bit for wanting to “end their lease” and try something else out – gardens are always evolving and changing! Can’t wait to see what you replace them with! Before getting rid of them all, you might want to try each of them in a pot for a little while. Sometimes a plant that looks sort of “blah” in the ground really comes into its own when in an appropriate container. This also lets you change the height of the plant, try it in different spots, fill in bare holes in other beds even temporarily, etc. Hi Alan – Thanks, thats actually a really good idea. I can put some of them in pots and move around, try in different spots … fabulous suggestion, thank you! Thats a good idea! I’ll ask the school over the road whether they would like them … or else I might transplant them onto the verge if noone claims them. Thanks for the ideas! Compost them if nobody claims them. They deserve returning to the earth since you find them unattractive. I’ll have to do that. I really don’t like doing it though. Will try to replant some of them. I used to be soft-hearted, too. But now, after having killed so many plants, I don’t mine pulling them up and doing away with them anymore! I do usually try to transplant them somewhere else first, if that’s an option. Good luck giving them away! LOL you’ve already done something with them – you paid them forward (“you are welcome to have these plants”). Generous eco-friendly option – hope someone near you takes you up on the offer.